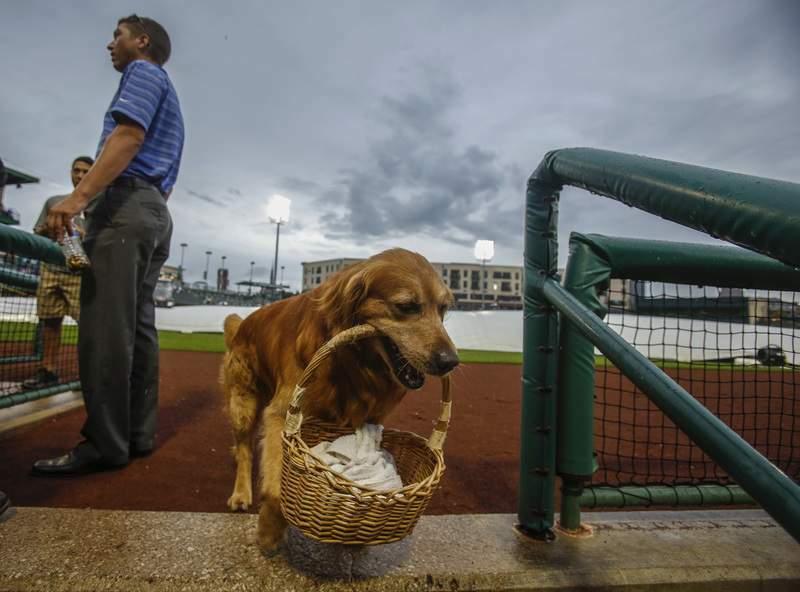 Chad Ryan | The Journal Gazette Jake the Diamond Dog heads to the TinCaps’ dugout before Monday’s game was canceled at Parkview Field. The rainout was the fifth straight day that weather was a factor in TinCaps games. Fans at Parkview Field waited in line for autographs, the TinCaps’ impromptu way of making up for the cancellation of Monday’s game against Clinton. The game, which was to end a rain-plagued homestand, was the second for Fort Wayne this season that was called off and will not be made up. As a result, the TinCaps (28-34) will finish the first half with no more than 68 games played. Fort Wayne begins a three-game series at West Michigan tonight and returns home Friday night against Bowling Green for their final three games before the All-Star break. Monday’s game never got started and was canceled just more than an hour past the scheduled start time of 7:05 p.m. But it was not a lost day, as a roster move became official that could offer a nice boost to the TinCaps’ rotation. The San Diego Padres dealt Alex Torres to the New York Mets in March for minor-leaguer Cory Mazzoni and a player to be named, which turned out to be 23-year-old Brad Wieck. The Padres have assigned Wieck, a 2014 seventh-round pick from Oklahoma City University, to the TinCaps. He was 3-5 with a 3.21 ERA in 10 starts for Single-A Savannah. The left-handed Wieck said he is slated to make his Fort Wayne debut Thursday. "I’m excited to be here," Wieck said. "I was throwing the ball well for Savannah, so I plan on keeping that coming over here. I plan on doing anything I can to help this team make a playoff push." Infielder Chase Jensen attended the same college as his new teammate, who has an enormous frame for a pitcher at 6-foot-9 and 255 pounds. "He’s really good," Jensen said. "I met him at an alumni weekend. He throws hard. We’re happy to have him." 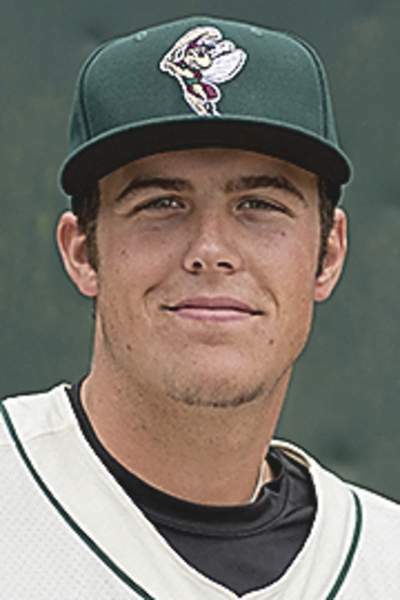 Wieck’s size is unlike anything the TinCaps have on their pitching staff, and he is also as old as anyone on it. "A mature kid," Fort Wayne manager Francisco Morales said. "In the couple hours he’s been here, I’ve loved how he has handled himself. Big strong, kid." Last summer, Wieck worked out of the bullpen during his professional debut in the short-season New York-Penn League and had 39 strikeouts in 252/3 innings. "I’m excited to watch him and see what he’s all about," Morales said. "I’m excited to see what the scouts and the organization saw in him." The corresponding move was that Jose Castillo, the 19-year-old Venezuelan lefty, was taken off Fort Wayne’s roster. Castillo was 0-1 with a 3.86 ERA in four starts and may pitch for short-season Tri-City, which opens play Thursday. In one other roster shuffle Monday, TinCaps infielder Nick Vilter was swapped out for 22-year-old Luis Tejada. Tejada, who hasn’t played this season, participated in 112 games for Fort Wayne in 2013 and an additional 46 last year. "He is going to have a chance to be at third base, especially against left-handed pitching," Morales said. "I think having Tejada out there, who can play first as good or better than Trae Santos, improves our ballclub."